Spring is here, and for most, it is a favorite time of the year. Why shouldn’t it be? The sun is shining, the flowers are in bloom, the birds are chirping, and the days are such that you can actually go out and enjoy some fresh air. Spring is also the time to refresh, not only yourself from being locked indoors all winter but also your home. Spring cleaning might seem as if it is a task that will take the fun out of spring, but it doesn’t have to be. In fact, spring cleaning can be something the entire family can enjoy. If you get motivated, dive in, and get it done, you’ll not only have a wonderful sense of accomplishment but also the time to do the things you really want to during the spring, so follow these tips to turn spring cleaning into a less daunting task. Without the ambition to do it, spring cleaning will become like climbing Mount Everest. You cannot hope to get your spring cleaning done if you aren’t motivated to do it in the first place. I won’t even get into how hard it will be to encourage your significant other and kids to pitch in if they aren’t inclined to do so. There are some easy things you can do to motivate yourself and your family, however. Sitting down with each family member and discussing a reward for completing spring cleaning tasks is your first step. The best way to motivate your family is to find out something each person really wants and then agree to it as a reward for completing spring cleaning. Does your son want the latest kill-’em-all video game? OK, he can have it when he finishes his chores. Does your daughter want a shopping spree at her favorite clothing store? Same thing. And your hubby can have his shopping spree at the hardware store or tickets to the ballgame once he finishes his list, too. Next, agree on the chores together. Sometimes, the best way to motivate others is to let them do the chores they want to do. The bottom line is that your house and yard need spring cleaning, so it doesn’t really matter who does what as long as it all gets done. Sit down as a family and make a list of all of the chores. Draw straws, or numbers, or whatever to determine the selecting order, and then each pick a chore you want to do until the list is covered. It’s fair, and everyone gets to do at least something they don’t mind doing. Agree on a set schedule together. Once the chores have been divvied up, it’s time to make a plan for completion that is realistic and agreeable to everyone. There’s nothing more deflating to motivation than having a list of chores that will take you all day. That isn’t fun no matter how you justify the work. Set up the chores so that they will get done but everyone has time for other things. If you’re planning on doing your spring cleaning during the spring break, for example, set a couple of hours aside each for everyone to work on their chores, and then have some family fun. Be realistic in your scheduling and allow for some down time; otherwise, everyone will become unmotivated very, very quickly. You’ve divided the work and scheduled it; now, it’s time to crank up the volume and get cracking. What’s your family soundtrack? Do you all have a favorite movie? If so, put on the soundtrack and enjoy the music while working. Do you all agree on an artist or band? Probably not, but if you’re lucky enough to do so, play that music. Otherwise, create a playlist of everyone’s favorite tunes and play that. Music is incredibly motivating when you’re cleaning; this is why I allow my staff to play music when they’re working. So crank up the volume and jam! Help out where you can. If you finish your list early, help the rest of your family with their list, and encourage everyone else to do the same. The bottom line is that spring cleaning has to be done, so why not help each other accomplish the end goal? Helping out once your list of chores is complete for the day is very motivating for everyone else. Teamwork is gratifying and encourages people to produce results. This is why projects are completed more effectively through teamwork than when someone tackles something alone. Celebrate. You’ve done it. You’ve completed your spring cleaning chores. Sure, you set up individual rewards, but why not go out and celebrate as a family, too? After all, you worked together to get the job done, so celebrate together. Go to your favorite pizza joint and order an extra-large with all of the toppings. Then, hit the movies, miniature golf, or another fun family activity. Spring cleaning is a daunting task, but you planned it, tackled it, completed it, and deserve an entire day of fun together to reward yourselves for it. 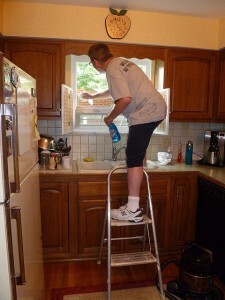 This entry was posted in spring cleaning, spring cleaning tips. Bookmark the permalink.